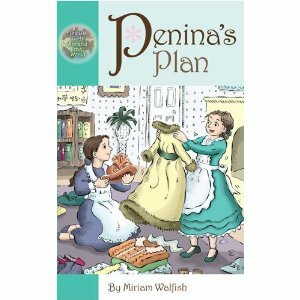 Expert Review of Penina's Plan by Miriam Walfish, one of our picks of the top Jewish books for kids! When Penina gets lost one Shabbat morning, she meets two Jewish children whose lives are very different from her own. Inspired by her family's tradition of chesed (kindness), Penina devises a plan to help them despite the many obstacles in her path. Meet Penina Mendes, a Jewish girl growing up in London, England, in the 1840s. Descended from Jews who fled from Spain in 1492, Penina is raised in luxury and cared for by her devoted nanny. Penina is clever and energetic and is just starting to learn about the world around her. Now you can learn about her world, too! Penina's Plan is first in a series. The next book is Penina's Doll Factory and the third book is Penina's Adventure at Sea. Goldy Says: "Colorful pics, great story."